Marty is interim rector at a small parish in my diocese. We visited recently and he showed me around, walking me all over the property and pointing out various improvements to the “physical plant.” He is a dreamer but not the kind who is content to leave the work to others. His energy is contagious. One project he showed me is a small organic garden, which was recently planted on the church grounds, easily in view of passing traffic. A bright yellow sign speaks of the “option for the poor,” which hearkens to Matthew 25 and is a theme running throughout liberation theology. Jesus tells us we will always have the poor with us – but he does not mean that we should give up, that we should ignore or abandon the plight of the poor. Jesus has a heart for the poor and the hungry. He has a heart for the neglected, the marginalized, the forgotten. Marty tells me that all of the beautiful produce from this garden goes directly to a local program that feeds the hungry. Fresh, gorgeous, highly nutritious life-giving food. 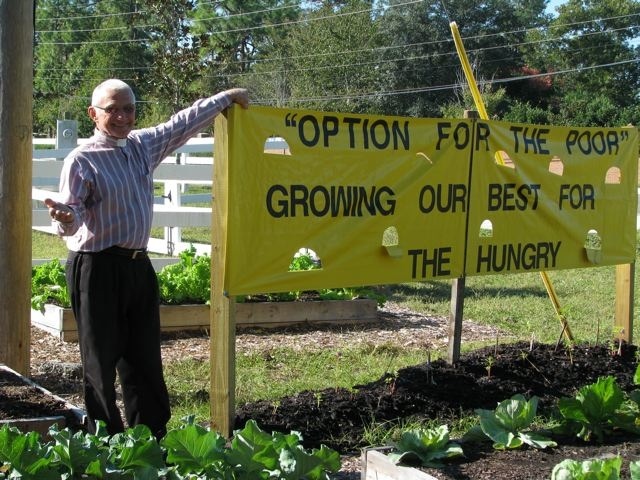 This program came about because of the vision of a single parishioner who felt called to start a garden. It came about because she responded. She said “yes” to the Holy Spirit and shared her dream with Marty. It came about because Father Marty supported her in this; he did not allow the way things have always been to stand in the way of what might be. I have always thought of interim ministry as a very special form of service, but one of people who serve more as stabilizing placeholders, until the “permanent” priest is hired, than as facilitators of emerging ministry. But, if we are honest about it, all priests are interims (parishioners, too). None of us is here permanently. And I doubt the Holy Spirit is deterred by whether a priest is “interim” or not. Jesus didn’t call us to follow him and serve others once we get settled. He doesn’t recommend tabling decisions and actions until someone more qualified comes along. He calls us to address need as we encounter it day to day. As a priest asked to lead and explore an emerging ministry, my takeaway from my time with Marty is to listen carefully to God and to the community around me. To dream dreams and to take action as opportunity presents itself. Where this road will lead is not my concern. Only God knows. This entry was posted in congregational development, Diocese of Florida, Episcopal church, faith, St. Clare of Assisi, Uncategorized and tagged 12-step spirituality, church planting, holy ground, hope, option for the poor. Bookmark the permalink.